Ms. Wyrick began her work with the firm in 1996 as an Associate and became a shareholder in January, 1999. 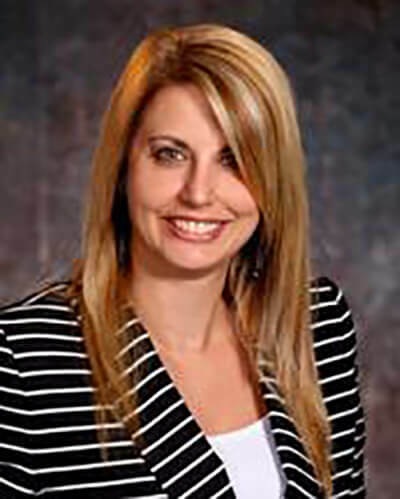 As part of her work with the firm, Ms. Wyrick serves as the City Attorney for Pigeon Forge, Tennessee. Prior to joining the firm, she served as a Judicial Clerk for the Honorable Houston M. Goddard of the Tennessee Court of Appeals and the Honorable Gary R. Wade of the Tennessee Supreme Court. In 1990, Ms. Wyrick received her BA from the University of Tennessee, where she majored in Political Science and minored in Business. (She completed her first two years of undergraduate work at Western Kentucky University from 1986-88.) While completing her undergraduate degree, Ms. Wyrick was named to the President’s List and to the Dean’s List and was chosen to participate in the University Scholar’s program, the President’s Council, the Phi Eta Sigma Honor Society and the Kentucky Honor’s Roundtable. She also received the Regent’s Scholarship for high school valedictorians. Ms. Wyrick received her JD from the University of Tennessee in 1994. She was awarded the John W. Green Scholarship, the W.K. McClure Scholarship for study abroad, and the Chancellor’s Citation for Extraordinary Campus Leadership and Service. She was also named to the Dean’s list, and was a member of the American Inns of Court and Moot Court Board. Ms. Wyrick was active in service to her fellow students and the University while seeking her law degree. She was elected Vice-President of the Graduate Student Association; was a member of the UT Library Friends Executive Committee; and held several leadership positions in the American Bar Association/Law Student Division, including Division Delegate, member of the Board of Governors and Resolutions and Credentials Committee, and Lieutenant Governor of Membership. Since graduating from law school in 1994, Ms. Wyrick has continued her involvement in professional organizations and serving the community. She is a member of the Sevier County, Tennessee, and American Bar Associations, National Conference of Bar Presidents, Southern Conference of Bar Presidents, International Municipal Attorneys Association, Tennessee Municipal Attorneys Association, Tennessee Trial Lawyers Association, Tennessee Lawyers Association for Women, East Tennessee Lawyers Association for Women, and the Lawyers Association for Women. Ms. Wyrick has been especially active in the Tennessee Bar Association (“TBA”) where she served as President from June 2013-June 2014, and also a member of the Executive Committee and the Board of Governors for many years. She is a past chair of the Programs Committee, the General Practice, Solo & Small Firm Section, and the Public Education Committee. Ms. Wyrick is also a past President of the Young Lawyer’s Division, a 2006 graduate of the Leadership Law Program, and a 2006 President’s Award recipient. She also served on the Executive Committee of the Tennessee Judicial Conference during her tenure as President of the Tennessee Bar Association. Ms. Wyrick has also been active in the American Bar Association (“ABA”) and particularly in the Tort Trial and Insurance Practice Section, where she is currently serving on the Scope and Correlation Committee, is a past Chair of the Medicine and Law and Law in Public Service Committees, Vice-Chair of the Workers Compensation Committee, and as a TIPS NOW Fellow. She has also served in the ABA’s House of Delegates. Ms. Wyrick was honored by the ABA GP Solo and Small Firm Section during the 2004-2005 bar year with one of the Section’s highest honors, the Small Firm Practitioner of Merit Award. She currently serves on the Tennessee Second Look Commission; as Vice-Chair and Commissioner for the Tennessee Lawyer Assistance Program; as a hearing officer for the Tennessee Department of Human Resources Board of Appeals; as a member of the Tennessee Board of Law Examiners Investigatory Committee; as a member of the University of Tennessee College of Law Institute for Professional Leadership Advisory Board; and as a member of the Advisory Committee for the Tennessee Justice Center. Ms. Wyrick has also served as a member of and secretary for the Tennessee Bar Foundation Board of Directors, as well as a member of the Foundation’s Governance and IOLTA Grant Review Committees. Additionally, she is a past chair of the Tennessee Justice Center Board of Directors. Ms. Wyrick is a Master of the Bench in the Hamilton Burnett Chapter of the American Inns of Court. She has been named a Fellow of the American Bar Foundation, the National Conference of Bar Presidents, the Tennessee Bar Foundation, the TBA YLD, and the ABA/YLD. Ms. Wyrick is an Emeritus Member and Past Chair of the Library Society of the University of Tennessee Knoxville, and served the University as a member of its 21st Century Campaign Committee. She has served on the Sevierville Intermediate and Middle School Parent Teacher Organization Boards. Ms. Wyrick is active in her church children’s program. Ms. Wyrick has been named as a Super Lawyer in the Mid-South each year since 2014, as well as being selected by the National Association of Distinguished Counsels as one of the “Nation’s Top One Percent” of attorneys. In 2002, she was made a Lifetime Member of the American College of Barristers and was granted the designation of Senior Counsel.